Each year, at the end of July, the board of the Railway inspected all the stations on the system. 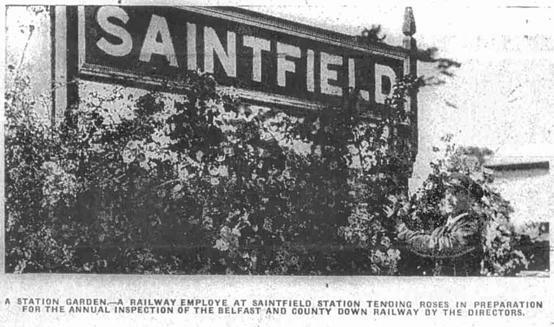 Prizes were awarded for cleanliness and the display of flowers in the station gardens. B. & C. D. RAILWAY SYSTEM. The management of the Co. Down Railway Company are to be congratulated once again upon the attractive appearance of their garden-stations. The prizes offered to the various station-masters have been an incentive to an ever increasing interest, and one sees an improvement with increasing years. The holiday seeker with buoyant spirits, and those of us who are in dire suspense regarding the fate of our dear ones at the front get many lessons from the beautiful flowers en route for Newcastle, Bangor or Donaghadee. Surely the horticultural work of art has been fairly well exemplified. Commencing at Sydenham we find Mr. Thomas Scott busy at his collecting station. He has displayed great ingenuity in cultivating so many lovely blooms; most prominent are his geraniums, pansies, holly-hocks etc. The beds are neatly planted on a green lawn with a goodly-number of shrubbery plants for a background. He won his prize with distinction which he well merited. Passing on the journey to Holywood for inspection we find Mr. F. Hambleston’s exhibition is much hid from view of the passing trains as his gardens are adjoining the house. Nevertheless, all is in splendid order. The sweet-pea is the best I have seen for years. 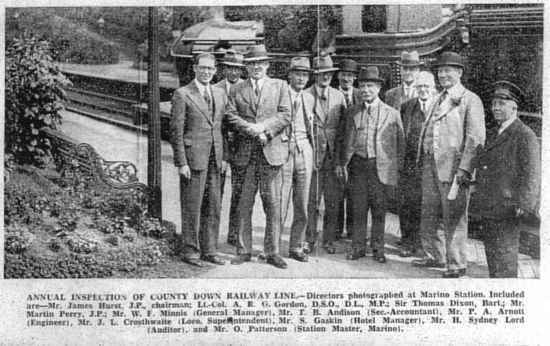 Following this station we reach Marino, where Mr. P. Dowds keeps the responsible post intact. Both he and Mr. Hambleton gained similar prizes as regards their stations. Cultra coming next in rotation we meet Mr. W. Craig. His show is par-excellence from roses to marguerites and other varieties too numerous to mention. A short distance brings us to Craigavad, and here Mr. B. Green scored a prize for his flower beds. While not an over abundance of flowers, yet his display is done with taste. With full steam ahead we reach Helen’s Bay, and nothing to comment upon except the signal cabin, which is kept in first class order. Mr. Rooney is handicapped by the narrow platforms, and flowers are out of the question, so one can easily observe the difficulty of competing. Carnalea comes next, and a different story presents itself. Here you have a veritable display of flowers, excellent rustic seats with rambler roses forming an arch; beds of begonias, geraniums, pansies, and creepers of every kind, all from the handiwork of Mr. Wm. McDade, the genial station-master who scored first merit. Returning I make my inspection of the main line. Joining the Donaghade train, I have a look at Bloomfield, and favourably commented upon. I congratulated Mr. H. Newman for obtaining a prize. The duties are heavy in collecting tickets for the city bound trains. Further journeys bring us to Neill’s Hill (Mr. W. Benett), Knock (Mr. W. H. Carlton), Dundonald (Mr. C. McLaughlin), who all score first prizes. Space does not permit a detailed account of these stations, but it is sufficient to state that roses have the most prominent place, and these men know how to cultivate them. I pass on to Comber, and congratulate Mr D. J. Johnston on his enterprise, acknowledged by many as deserving recognition. Fromthis we pass on by Newtownards for Groomsport Road station, where a prize was awarded to Mr. Thomas Rice. With a one-sided platform he has made a very unique show of flowers of all sorts. One can see the improvement here year after year. Nothing to note at Donaghadee, I return to Comber to join the Newcastle train, whence I journey to Saintfield, and there congratulate Mr. G. Black for obtaining a second prize. Both platforms show an excellent display. Following this I reach Crossgar, which comes in for merit in the person of Mr. H. Hunniford, who fully deserves the honoured prize. At Ballynahinch junction Mr. D. Rice met with the same award as crossgar. Both have a splendid display of flowers. After a delightful journey I inspect the Newcastle terminus, which is kept in first-class order. The wire baskets, filled with flowers, suspended from the glass roof beams, greatly adds to its attractive appearance. Journeying back as far as Downpatrick I join the train for Killough station, with all its quietude. Here the station is filled with Clarkias, Godetia, summer chrysanthemums, antirrhinums, French marigolds, stocks etc., etc. These flowers are specimens rarely seen in such places. Mr. John Nougher deserves the highest praise for his magnificent work of art. He scored first prize, which he fully merited. I pass on to Ardglass, a centre famous for herrings. Flowers seem to be out of the question. A total of 15 prizes were awarded, and I heartily congratulate the recipients, and extend my appreciation to Mr. Chas. A. Moore, Mr. F. H. Minnis, and Mr. W. Mellow for their deep interest in this work, in what may be termed the best combination of garden-stations, either in Great Britain or on Continental railways. The following picture is taken from the Belfast Telegraph 1939.